Offered here is an another nice CRUSHER JOE ANIMATION CEL with a PAINTED BACKGROUND from the Crusher Joe Movie done in 1983. The classic anime cel is in excellent condition with only some very minor wear at the corners of the background. This piece will look sweet in a frame. The production code# is: C2003C A-3. The cel measures 10 1/2” x 9” and is stapled to a background that measures approx. 10 3/4” x 9 1/4”. This original animation cel is from the collection of Toren Smith, creator of STUDIO PROTEUS and one of the key figures involved with bringing Japanese Anime to America. Your chance to snag a stunning piece of history from a classic anime series! Crusher Joe is a series of science fiction novels by Haruka Takachiho and released by Asahi Sonorama from 1979 to 2013. During the late 1970s one of the founding fathers of Studio Nue, Takachiho decided he would try his hand at penning novels. The result was Crusher Joe, a group of anti-heroes who were not the typical self-sacrificing types but noble in their own rights nonetheless. Crusher Joe was made into an animated film in 1983, and a pair of ‘for-video’ animated episodes in 1989. The film version won the Animage Anime Grand Prix prize in 1983. Categories: ART, ORIGINALS, Animation. 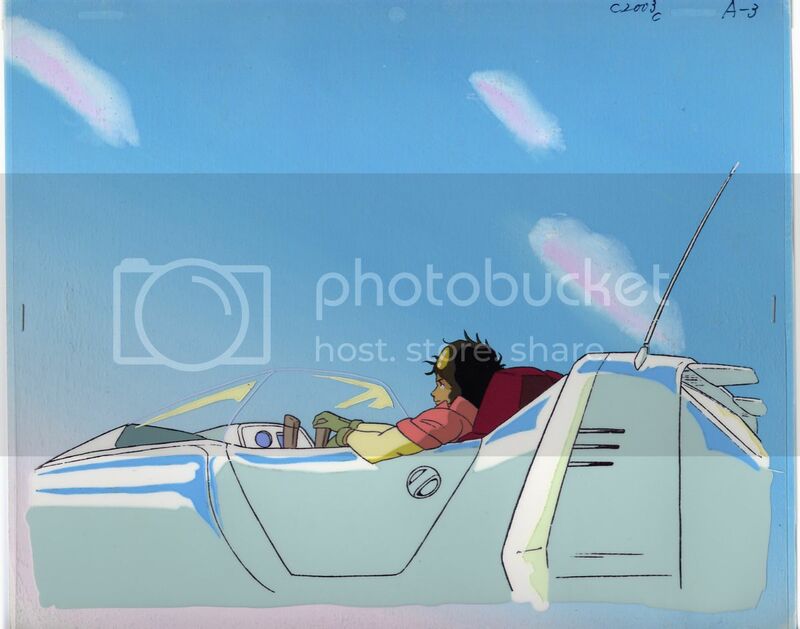 Tags: collectibles, anime, Crusher Joe, Haruka Takachiho, Studio Nue, animation, art, cartoon cel, original cel, Pop Culture, science fiction. Be the first to review “CRUSHER JOE MOVIE Animation Cel with PAINTED BACKGROUND (1983)” Click here to cancel reply.